It's kind of sad that one of my favourite comic shops in Melbourne is one that many comic fans don't know about, or have never been to. 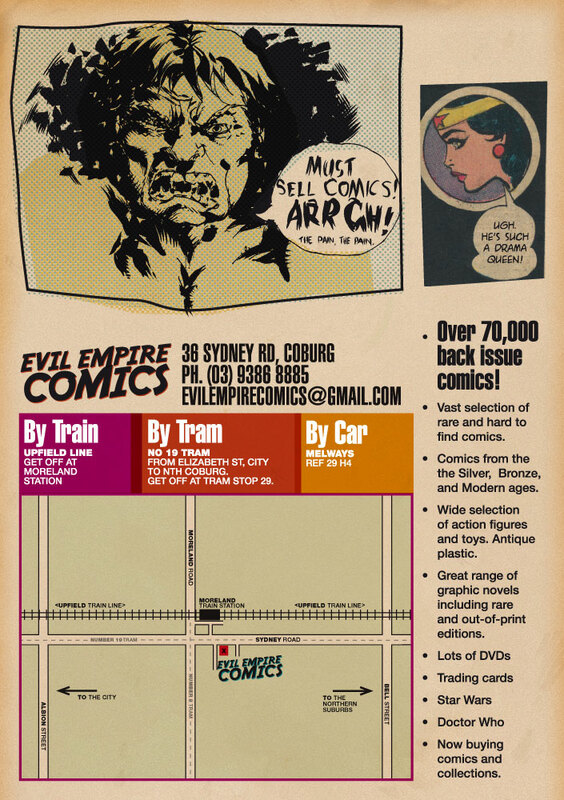 Evil Empire Comics in Coburg (in Melbourne's northern suburbs) is a great place to go when you are looking for a hard-to-find graphic novel or comic. They have an insane amount of back issues (rivaled perhaps only by Alternate Worlds for Melbourne-based stores) and there are many bargains waiting to be found on their shelves and in their longboxes. On a recent visit the owner asked me to help out designing a colour flier. 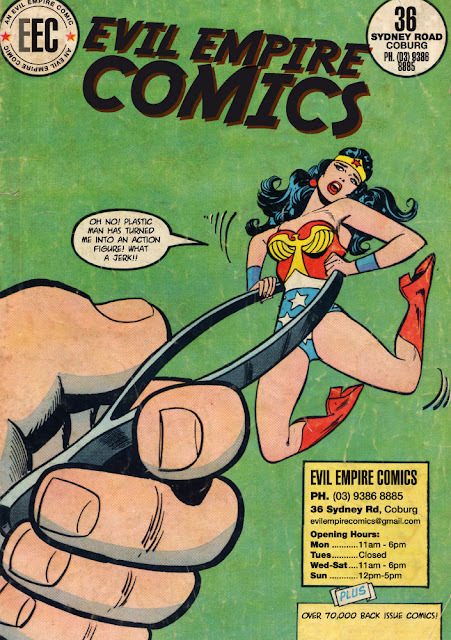 The front of the flier is a photoshoped cover of an old wonder woman comic (with all the original titles etc laboriously removed in Photoshop), the back cover was designed to suit the 50's aesthetic of the cover, with a quick (done in 15mins) drawing of Hulk on the back, from direction from the shop owner. I'm pretty happy with the way it turned out, and I urge you all to head down to Evil Empire Comics, it really is a great place to shop. You can find it at 36 Sydney Rd Coburg, or call on 9386 6665. Do yourself a favor and pop in sometime soon.